The college reopens during 3rd week of june after the summer vacation and admission will commence from the dates as per intimation. The college is affiliated to CHSE, Orissa and imparts teaching in Science and Arts. Following : Physics, Chemistry Biology, Mathematics. Compulsory subject : English, M.I.L, Environmental Education . (5) Hist., Pol. Sc., Oriya, H.Sc. (6) Pol. Sc., Log, Hist., Edu. The Application From Shall be accompanied by the following attested documents. Originals shall be produced at the time of admission. Mark- Sheet of last Examination passed . Three copies of attested passport size photograph. Students passing the Examination in correspondence course are required to produce the course completion certificate from the competent authority at the time of admission. The College reopens during 1st week of July after Summer Vacation and admission will commence from the dates as per intimation. Forms and prospectus for admission can be obtained on all working days from the college Office counter on payment of Rs. 50/- (fifty) only. The application form for admission shall be accompanied by the attested erox copies of the following documents and the originals of the same must be produced at the time of admission. 1. Transfer certificate from the college last attended. 2. Make sheet of the last examination passed. 3. Character certificate from the college last attended. 4. Three copies of the attested coloured passport size photographs. 5. Money receipt showing payment of Rs. 50/- towards application from. Students passing the examination in correspondence course are required to produce the course completion certificate from the competent authority at the time of admission. 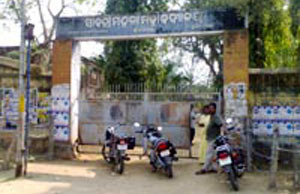 The college is affiliated to Berhampur University. Odisha and imparts teaching in +3 Arts, +3 Science shall be introduced from the session 2009-10. A student desires to be admitted in +3 Ist Arts/Science classes has to offer the subjects as mentioned below. COMPULSORY SUBJECTS : (1) English (2) MIL (3) India Society (4) Environmental Science. OPTIONAL SUBJECTS : A student has to choose one subject as her pass/ Hons subject in Arts, two pass subjects for science and two subject as her electives out of list given below. Pass Subject(ARTS ) : Economics, Education, History, Home Science, Oriya, political Science. Pass subject (SCIENCE): Physics, Chemistry , Mathematics, Botany,Zoology. Elective subject (Major) : Math ., Material Science,India Economy, India Polity, LMIH, oriya. Eletive subject (Major) : Math ., Material Science, Bio Technology. Elective Subjects (Minor) : Math . & Biology. In choosing the elective Subjects the students may refer to proforma II . India polity /India Economy/Home Science/Education/oriya.